You are here: Home > MCSD News & Alerts > MCSD News & Alerts > CMS News > Original Jefferson Elementary Inventory Sale! November 5th & 6th! The Board of Education for the Muscatine Community School District has hired FEH DESIGN to deconstruct and demolish the original Jefferson Elementary. As part of that project, FEH DESIGN will be holding a public sale on the current furniture, equipment and materials inventory in the original Jefferson Elementary. Items include but are not limited to elementary furniture, teacher’s desks, file cabinets, metal shelving cabinets, original wood cabinets, original wood doors, newer wood doors and kitchen equipment. 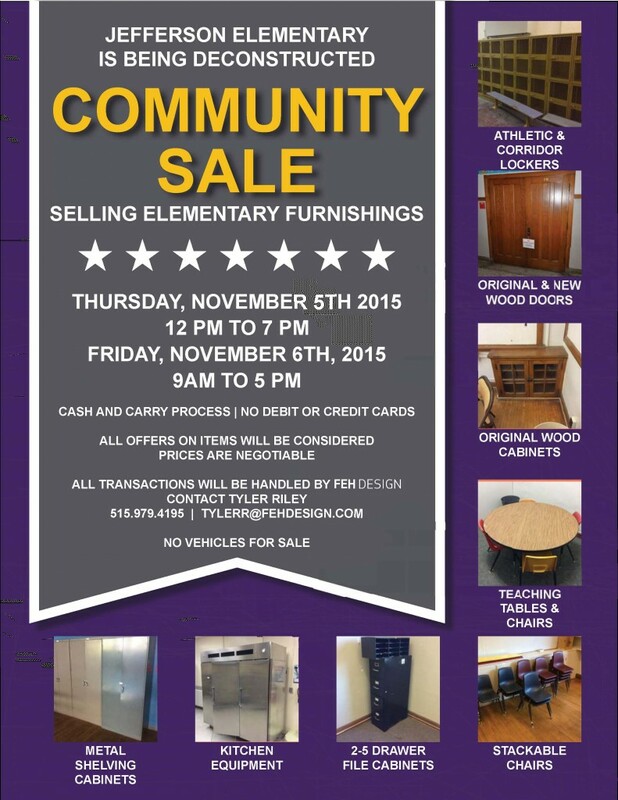 Thursday, November 5, 2015 from Noon to 7 p.m.
Friday, November 6 from 9 a.m. to 5 p.m. Contact Tyler at tylerr@fehdesign.com if you have questions.